October 26 (The Australian) An improved outlook for copper and gold has helped add $US1.3 billion ($1.7bn) to the value of the $US5.3bn expansion of Rio Tinto's Oyu Tolgoi copper and gold mine, which the miner says could ramp up in seven years to ­release $US1.5bn of annual free cash flow. As Rio group executive of growth and innovation Stephen McIntosh led investors on the mine tour, chief executive Jean-Sebastien Jacques was in Beijing last night for a dinner to celebrate Rio's 50th anniversary of iron ore exports. At the ceremony, which followed a celebration in Perth in August, Mr Jacques said Rio's long-held view about strong long-term demand for iron ore had been reinforced. "We firmly believe there's a lot more of the China story to come," Mr Jacques said. "There's been some volatility from time to time, but the under­lying fundamentals remain strong, reinforcing our optimism about the long-term outlook." Ahead of the Mongolian mine tour, UBS analyst Glyn Lawcock emphasised the project's risks. "In our opinion, Oyu Tolgoi is a high-risk project for Rio Tinto and Turquoise Hill due to country risk, single customer (China) risk, technical/geological risk and commodity risk," Mr Lawcock said. Macquarie analysts were more buoyant, saying a potential expansion to 1 million tonnes a year or more of copper — flagged by Turquoise Hill earlier this year — could have a net present value of $US11bn. "Our deep dive into the potential of Oyu Tolgoi indicates that the larger development options are conservative," they said. October 25 (Proactive Investors) Kincora Copper Ltd (CVE:KCC) provided an update on Tuesday on the Ibex transaction following sign-off from the Mongolian tax authorities, a key milestone toward the completion of the proposed mergers for the respective Kincora and Ibex subsidiaries. The parties to the Ibex transaction, High Power Ventures Inc. and Kincora, have had their original tax position upheld, with the subsequent administration processes related to closing the transaction continuing and expected to shortly complete. "It is pleasing to pass this key milestone towards completion of the Ibex transaction, and we look forward to providing further details on the company's near-term strategy in due course," said Sam Spring, Kincora president and chief executive officer. "I would like to thank all involved, including the Mongolian tax authority, who ensured this matter was addressed. This milestone supports the transition to the next stages of completing the Ibex transaction." The transaction will result in a consolidated landholding of over 1,500 square kilometres, the majority of the prospective exploration licences which dominate a key geological trend between and along strike from the Oyu Tolgoi and Tsagaan Suvarga (Devonian) copper mines, supporting an industry-leading proposition of copper-gold and gold targets. Ibex's portfolio was secured and targets advanced by former key executives of Oyu Tolgoi's exploration team and focused on Tier 1 gold-rich copper porphyry targets. A large and high-quality regional geophysical and surface geochemical data set supports various style targets: (i) Devonian porphyries, (ii) traditional gold-rich copper porphyries, and (iii) epithermal and Carlin-style gold deposits. The transaction consolidates a regional portfolio in an underexplored but potentially world-class gold-rich copper province, analogous to exploring the majority of the Northern Chile copper belt from the 1970s. The transaction will result in a strengthened team with discovery experience and complementary skill sets for exploration through to project development internationally and in Mongolia. · Pursuant to a MOU signed on the 14th of July 2016 between Singapore Cooperation Enterprise ("SCE") and the Mongolian Energy Development Centre ("EDC") to enter into mutual cooperation by identifying suitable opportunities for the investment, development and setting up of coal-to-electricity, coal gasification and transportation/delivery of electricity and gas projects, SCE has introduced Poh Golden Ger Resources Pte Ltd to EDC as a company with interest in cooperating with EDC in exploring suitable opportunities in these areas of the Energy Sector in Mongolia. · The signing of the MOU was witnessed by the Prime Minister Lee Hsien Loong of Singapore and Prime Minister Jargaltulgyn of Mongolia. · The handover of the Letter of Introduction from SCE was witnessed by HE George Lkhagvadorj, Mongolian Ambassador to Singapore and Mr. Gantulga Tudevkhuu, Vice-Minister, Mongolia Ministry of Energy. · Tian Poh Resources Limited owns the Nuurst Coal Deposit in Mongolia, a JORC (2012) 478 million ton resource approximately 100km from Ulaanbaatar. · Tian Poh has commissioned pre-feasibility studies on a Coal to Gas facility that will be fed by Nuurst, and a Gas Distribution Network to Ulaanbaatar. 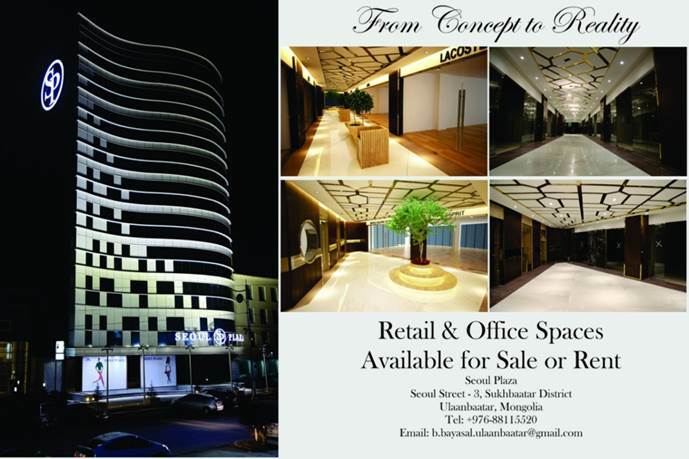 · Poh Golden Ger Resources Pte Ltd is a 100% subsidiary of Tian Poh Resources Limited. Singapore Cooperation Enterprise ("SCE") is an agency formed by the Ministry of Trade and Industry and the Ministry of Foreign Affairs of the Republic of Singapore, and an integrated arm of International Enterprise Singapore, to share Singapore's expertise in public sector development with interested foreign governments and related entities. Energy Development Centre ("EDC") is an agency affiliated to the Mongolian Ministry of Energy. EDC was established under Ministry of Energy by the Government Order No. 51 on 22nd of September of 2012. EDC conducts estimation, evaluation and analysis necessary for government to develop energy policy; accredit design drawings of the energy facility and equipment; develop feasibility studies of the new energy sources; implement and supervise projects financed by state budget as well as foreign financial resources; and conduct various chemical tests and analysis on the energy generation plants for their safe operation. October 25 -- Haranga Resources Limited ('the Company') is pleased to report on its activities for the September 2016 quarter. During the quarter, the Company continued compliance activities required by the laws and regulations of Mongolia in order to maintain all licenses in good standing. The Company is assessing a number of development and exploration projects within and outside of Mongolia. On 5 July 2016, the Company announced that it had signed a Binding Terms Sheet with Sanjiv Noronha for an unsecured finance facility of AUD$200,000. The facility has an interest rate of 6% pa capitalised monthly with a repayment date of 31 December 2016. The funds from the facility have been utilised by the Company to satisfy Mongolia exploration and mining license commitments. On 20 September 2016, the Company announced that it had successfully completed a placement to sophisticated investors to raise $174,000 before costs. The placement consisted of 58,000,000 fully paid ordinary shares priced at $0.003 per share. Post quarter end, the Company announced the resignation or Mr Michael Riady on 14 October 2016. On 24 October 2016, the Company announced the resignation of Mr Erdene Tsengelbayar. During the quarter, applied to Mineral Resources Authority (MRAM) of Mongolia to extend its Chuluun Khoroot Tungsten Project licence for an additional three years until 26 September 2019. Subsequent to the end of the quarter the Company was advised it was successful in its application, with the Company successfully extending the Chuluun Khoroot Tungsten Project licence until 26 September 2019 and reducing the tenement area from 12,658 ha to 2,786 ha. On 5 April 2016 the Company issued the Entitlement Issue Prospectus for a renounceable entitlements issue of approximately 52,499,439 Shares at an issue price of $0.025 on the basis of nine (9) new Shares for every eight (8) Shares held by Shareholders on the record date, to raise approximately $1,312,486 (Offer) before costs. On 11 May 2016 the Company announced it received valid acceptances under the Offer for 9,869,080 new shares with a shortfall of 42,630,359 shares. During the quarter, on 5 August 2016, the Company completed the allotment and issue of the 42,630,359 shares. The Offer was fully underwritten by Lead Manager, Broker, Underwriter and Corporate Advisor, CPS Capital Group Pty Ltd (CPS). The mandate also engages CPS to seek to introduce potential assets that EUM may be interested in acquiring and to provide general ongoing corporate advice. October 25 -- During the three months to 30 September, 2016, Perth-based Viking Mines Ltd (Viking or the Company) activity was focussed on reviewing new mining project opportunities, while progressing Government approval of the sale agreement for the Akoase gold project in Ghana. Lodgement of the field inspection report conducted by two representatives from the Ministry of Tourism, Green Development and Environment has been delayed due to the recent Mongolian elections, where there has been a change of Government, senior ministers, public servants and advisors. This follows a previously reported Government Resolution that licence areas in headwater zones and river basins are to be annexed and revoked. The Company has been advised by the Ministry of Tourism, Green Development and Environment that approximately 53% of the Berkh Uul prospecting licence falls within a headwaters of rivers zone. This government determination impacts upon the Company's current coal resource. Viking expects to receive a formal response from the field inspection and the status of the government review process in the next quarter. A further written submission outlining the potential benefits of a mining project to the regional and State economy is planned to be lodged with the government in the December quarter. No on-ground work was undertaken on the project during the quarter. During the quarter the Company accelerated and intensified its review of mineral project farm-in/acquisition opportunities in the expectation that the final Akoase sale proceeds will be received during the December quarter. One project review is currently at an advanced stage of consideration. Viking will continue to pursue this and any other opportunities, which are complementary to its existing project portfolio and consistent with its core objective to acquire near term production assets with potential to deliver sustainable cash flow. The Company has appointed corporate adviser Emerald Partners Pty Ltd to assist in the search for suitable new advanced mining projects. Emerald Partners advised the Company on its sale of the Akoase gold project and has previously been a corporate adviser to the Company. October 17 (FMG Funds) In the second quarter we reported on improving conditions in Mongolia. In the third quarter we reversed all those gains and more in the worst quarter reported in many years. Apart from the strength recorded in coal prices, all indicators pointed south. Offshore stocks were punished as the rally in hard commodities subsided. 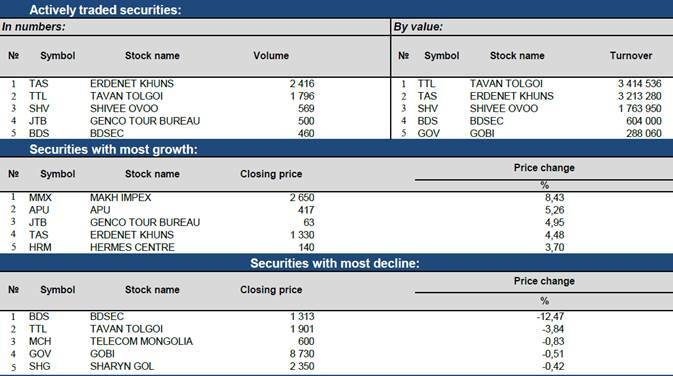 The local stock market lost a massive 20% mainly due to the Tugrik weakening 15%. 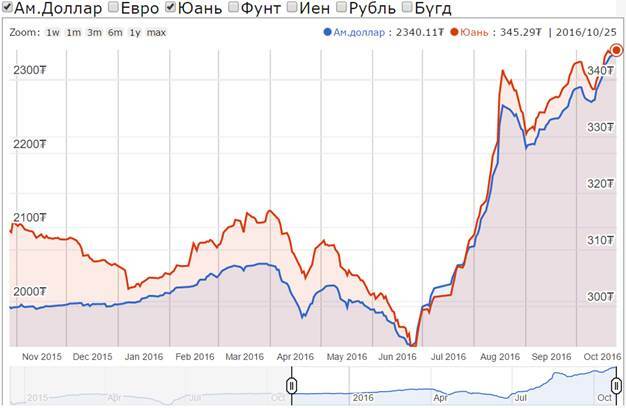 To stem the FX rot the Bank of Mongolia stepped in and hiked the policy rate by 4.5%, one of the highest rate hikes in the world in recent history. The policy rate is now at 15% which is again one of the highest in the world and the highest Mongolia has seen in over a decade. The move has steadied the currency and was a step in the right direction. The country's fundamentals are weak, but with a new market-friendly government in place committed to the task of improving the economy we are slightly optimistic. We also note that that with Mongolian assets trading at or near multi-year lows, a small spark could ignite a strong re-rating. 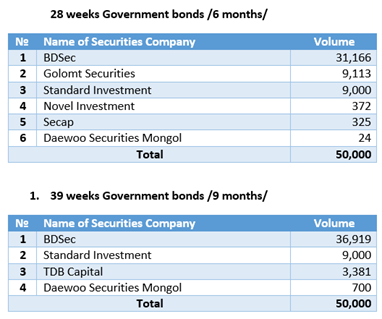 October 25 (MSE) On 25 October 2016, 28 weeks Government bonds /16.897% annual coupon rate/ worth MNT5.0 billion, 39 weeks Government bonds /16.990% annual coupon rate/ worth MNT5.0 billion traded respectively at Mongolian Stock Exchange. 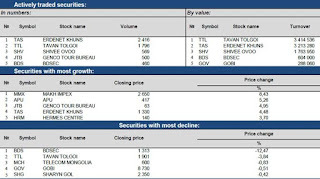 October 25 (Bank of Mongolia) Spot trade: Commercial banks bid MNT 2338.00-2352.61 for USD53.1 million and MNT 343.55-346.55 for CNY77.5 million respectively. The BoM did not accept any bid offers. October 25 (Reuters) Copper prices have rallied from their January lows, but investors looking for further hefty gains may be disappointed as ample supplies are likely to more than offset stronger demand in top consumer China. Funds' net long position at 36,019 lots or more than 900,000 tonnes is down from 42,624 lots on Oct. 12, suggesting some are rethinking, but it is still more than three times the 9,987 lots clocked on Sept. 12. "We can argue about whether Chinese demand growth is zero, one, two or three percent," Guy Wolf, global head of market analytics at Marex Spectron said. "But it's hard to imagine what would push it into the high single, double digit percentages needed to push up prices significantly." Oct 25 (Reuters) Surging prices for coking coal will likely drive Japan's top two steel producers to miss their earnings forecasts for this financial year, but will help suppliers of the steelmaking ingredient such as Mitsubishi Corp , analysts said. Lower-than-expected profits at Nippon Steel & Sumitomo Metal and JFE Holdings, already grappling with a stronger yen, could ramp up pressure to raise prices for steel products. Spot prices for premium hard coking coal .PHCC-AUS=SI in Australia, which dominates global exports, this week surged to over $245 a tonne. That took the rally so far this year to more than 200 percent, after China moved to cut overcapacity in its mammoth coal sector. 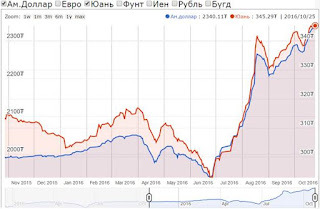 October 25 (Bloomberg) Iron ore is surging thanks to its bulk-commodity compatriot, coal. Benchmark spot prices topped $US60 a tonne for the first time since August after futures in China went limit-up as coal's rally pulled steel and other raw materials in the supply chain higher. Spot ore with 62 per cent content in Qingdao climbed 4.5 per cent, the most in almost three months, to $US61.96 a tonne on Tuesday, according to Metal Bulletin. The contract for January delivery on the Dalian Commodity Exchange surged 3.9 per cent. "Iron ore alone can't make steel, it needs the help of coking coal," Dang Man, an analyst at brokerage Maike Futures in Xi'an, China, said by phone. "The shortage in coal supply right now seems unlikely to improve before year-end. That's driving steel prices and production higher, benefiting iron ore too." After three years of slumping prices as mine supply rose and China slowed, iron ore has gained 42 per cent in 2016 as Asia's top economy boosted stimulus. Steelmakers in the country that produces half of world output have fired up plants after stronger demand boosted prices and expanded profit margins. Coal prices have soared in 2016 on tight supplies, and HSBC Holdings has said the surge in coking coal will probably keep global steel prices elevated. October 25 (news.mn) The Judicial Standing Committee called a meeting at 15.00 today (25th October) to discuss matters regarding the Erdenet Mining Corporation (EMC) and MongolRosTsvetmet LLC. According to an official source, Ch.Saikhanbileg, head of the previous cabinet attended the meetings. On June 28th, day before the country went to vote in the general election, Prime Minister Ch. Saikhanbileg announced the transaction of Russian shares of the largest copper and molybdenum mine to a Mongolian company called the Mongolian Copper Corporation. Following the announcement, the Mongolian People's Revolutionary party strongly condemns the sale while main opposition Mongolian People's Party (MPP) issued an statement calling the sale illegal. The MPP, won the June election in a landslide victory and is currently embroiled in various issues involving the previous administration. Ulaanbaatar, October 25 (MONTSAME) Being carried out by Solar Power International LLC, the project is going on construction and fabrication phase, which commenced on July 27 of 2016. The project accomplishment is 65 percent. A total of 32,274 solar panels of SHARP have been installed in 289,667 square metres of area in Khongor soum of Darkhan-Uul aimag (210 km from Ulaanbaatar). Moreover, a building for SMA Inverter has been built along with the overhead grids to connect the plant to the substation with installed capacity of 110/ KW. The commissioning of the plant is expected on December 15, 2016, reports the Ministry of Energy in the light of the Government's First 100 Days Framework. October 19 (Tengri) Having started Tengri as a result of travels, it made sense that our first collaboration is the result of another travel-related theme. The limited-edition quarter-zip sweater, 'The Mariner', brings together Harry's and the Cunard Yanks' transatlantic adventures of the 1950s, utilitarian functionality, and Tengri's modern-day warrior spirit, to create a piece of high-quality knitwear. The classic design of this sweater became synonymous with Harry Stedman's workwear, easy to pull on and off, and worn over a trusty white T-shirt, and underneath his pea coat or slicker jacket in adverse conditions on deck. The new translation created with Tengri Noble Yarns has been knitted in a small Scottish mill just south of Glasgow, hand-loomed by a passionate team of craftsmen and washed in the same soft waters used by local whisky distillers. In keeping with our spirit of adventure, respect for nature and authentically capturing the spirit of places where Tengri garments are sourced and made, The Mariner was photographed in Scotland by one of the world's leading expedition and adventure travel photographers, Martin Hartley. We're honoured to have the opportunity to recreate a piece synonymous with Harry Stedman's influential look. Every detail of the Harry Stedman brand links to Harry's life stories and adventures, from the first point of research to the last stitch sewn on a garment, and quality is everything. Tengri's noble yak yarns complement and elevate this piece, bringing it to life with luxurious fibres that offer unique properties that stand the test of time. Ulaanbaatar, October 25 (MONTSAME) In the last three months, 1,562 households in Ulaanbaatar were connected to power grids. According to a survey, the capital city numbers more than 10 thousand households that still do not have access to electricity. MNT 2.0 billion has been allocated for this purpose by the Regulatory Committee on Energy and the Ulaanbaatar Power Grid System state-owned company, in compliance with the Ministerial Order issued on August 26, 2016. The new power grid installations were executed between September 5 and October 3, reports the Ministry of Energy. October 25 (Mongolian Economy) "Smoke emission from ger districts could adversely affect groundwater," warned experts at the 24th meeting of the UNESCO International Hydrological Programme's (IHP) Regional Steering Committee for Southeast Asia and the Pacific. In addition to Mongolia, more than 40 representatives from 14 Southeast Asian and Pacific countries are participating in the meeting. Water contamination is one of the main reasons for water shortages across the globe, and ensuring the safety of drinking water is a key aspect of the Sustainable Development Goals (SDGs). The main purpose of this meeting is to develop cooperation among Southeast Asia and Pacific countries in hydrological research and education, to discuss the outcome of research projects and programmes implemented within the framework of the IHP and to exchange experience and opinions regarding challenges. Mongolia lacks clean surface-water resources. Contamination of drinking water could spell disaster for an exceedingly concentrated place like Ulaanbaatar. Coal burned during the cold months pollutes the air, and in turn, polluted rainwater soaks into the ground, contaminating underground water. The majority of Ulaanbaatar residents utilise groundwater in some fashion, but ger districts are especially dependent on groundwater. These conditions add to the already difficult public health situation of ger district residents, and thus, meeting participants reminded that comprehensive solution for drinking water as well as air and soil pollution is needed. The question of building dams in order to create clean water reserves has been discussed in recent years. This is would be something new for Mongolia, for which the country may need to seek international advice and expertise. However, there is a need to be cautious in introducing this experience in Ulaanbaatar, warned Dr. Maki Tsujimura, professor at the University of Tsukuba. Today, the world faces a drinking water scarcity, and about 884 million people are consuming water of inadequate quality. More than 1.5 million children die every year due to lack of drinking water and pollution. The meeting participants noted that state as well individual action and awareness is vital for environmental protection. October 25 (gogo.mn) Delegations, led by Mr Mehmet Erdogan, the head of the Turkey-Mongolia Friendship Group in the Grand National Assembly of the Republic of Turkey are paying an official visit to Mongolia on Oct 25-29th. In scope of the visit, the delegations are scheduled to meet with Speaker of the Parliament M.Enkhbold and the head of the Turkey-Mongolia Friendship Group in State Great Khural of Mongolia T.Ayursaikhan. Moreover, they will hold meetings with MP and the Minister of Defense B.Bat-Erdene and the members of the Mongolian Alumni Association of Turkish Universities "ATA". Following, the delegations will visit historic and cultural sites of Turkish empire located in Kharkhorin city and Nalaikh district. During the visit, the delegations will discuss the relations of legal institutions and exchange their views on events happening in politics, economy and social sector. Also, the delegation will give statement on Turkish coup attempt against state institutions. October 25 (news.mn) Mongolia celebrated the 60th anniversary of the creation of "Maamuu naash ir" , which is translated as 'let's play together', which was held on 25th of October. The song is the first song every Mongolian child learnt in the past six decades. As a part of nationwide anniversary, Mongolians sung the song at 11.00 am across the country. The song even has its own monument where flowers were brought; at the Children's Palace of Mongolia a concert was staged. The lyrics "Maamuu naash ir" where written by S.Lkamsuren and the music by Honoured State Artist D.Luvsansharav in 1956. October 25 (news.mn) The Gandantegchinlen Monastery, which is the main Buddhist centre in Mongolia will mark the 20th anniversary of the rebuilding of Avalokitesvara statue on 26th of October. The 26.5-meter-high statue of Avalokitesvara - an incarnation of the Buddha, is the tallest indoor statue and stands in the main temple of the monastery. The original statue was made of copper, was constructed after appeals to the Mongolian public; its intent was to restore the sight of the 8th Jebtsundamba, also known as Bogd Khan, who had claimed the title of Emperor of Mongolia. At the height of Stalin's purges in 1937, during which thousands of lamas were killed, Soviet troops dismantled the original statue. Following the collapse of the USSR and the return to democracy, the statue of Avalokitesvara was rebuilt with donations from the Mongolian people. The giant statue was completed in 1996. At the opening ceremony, the Dalai Lama blessed the new Avalokitesvara statue in Gandantegchinlen Monastery. The statue contains 2,286 precious stones, flowers, the Ganjuur, Danjuur sutra, a life-sized Mongolian ger and is gilded with gold leaf. Mongolia - "Keep the charism and the spirit of Don Bosco in families and in society"
October 25 (ANS - Ulaanbaatar) - Yesterday, 24 October, was the third day of the visit of the Rector Major Fr Ángel Fernández Artime to Mongolia. He spent almost the whole day in the community of Ulaanbaatar. First he met the Council of the Provincial Delegation of Mongolia and blessed the new building of the Salesian Reception Centre. Then he presided over a solemn Mass in the Cathedral of Saints Peter and Paul, attended by all the Salesians and members of the local Salesian Family. Then, in the Don Bosco Technical School, there was a cultural programme attended by between three and four hundred people, including Msgr Wenceslao Padilla, Apostolic Prefect of Mongolia, students of the Salesian School and of the kindergarten run by the Daughters of Mary Help of Christians, parishioners from Darkhan and the faithful from Shovoo, the new missionary centre recently entrusted to the Salesians. The cultural show opened with the Mongolian national anthem, and continued with traditional dances, music and song. The Rector Major expressed his gratitude to the local Church and the Mongolian people for their active cooperation with the Salesians in the service of young people. At the conclusion of this event, everyone present was given a small gift with the words "The family is a school of life and love". In the afternoon Fr Á.F. Artime visited the Salesian mission in Shovoo, 40 km away from the city. Back at Ulaanbaatar in the evening, he spoke with Msgr Padilla on the challenges facing the Church in the country. He then attended a farewell party with the Salesian Family. "Keep the charism and the spirit of Don Bosco in families and in society" was his final message. Early this morning 25 October he was accompanied by the 11 Salesians working in Mongolia to the "Chingez Khan" airport and from there he departed for Seoul in South Korea. Fr Leung expressed his gratitude to Fr Á.F. Artime for his visit to the country, and also to Fr Václav Klement, Councillor for the East Asia-Oceania Region, and Fr Horacio López, Secretary of the Rector Major. October 25 (news.mn) An ancient bone bed in a remote Mongolian desert presents tantalizing clues that dinosaurs of a feather may have flocked together for the same reasons modern birds do. "We're starting to realize how much birds have inherited from their dinosaur ancestors," said Gregory Funston, a paleontologist at the University of Alberta and lead author of a paper published Monday in the journal Nature. The site, a two-day drive from the Mongolian capital of Ulaanbaatar where everything researchers need to live and work had to be trucked in, still has much to teach. Funston said only about 12 square metres of a 100-square-metre dig have been excavated. Further research on the bones could be productive as well. If it turns out males are prevalent, that suggests the fossil bed could be a former site for mating behavior. October 24 (UB Post) Earlier this month, the National Geographic featured the National Museum of Mongolia's discovery of the mummified remains of a horse and rider, buried together in a cliffside cave over a millennium ago. J.Bayarsaikhan, who led the team of archaeologists that found the rare mummified remains, spoke about their discovery and exploration in Myangad soum of Khovd Province in the interview below. Your team of archaeologists discovered the first mummified remains of a horse and rider in Mongolia. When did your team set off to Khovd Province? How long was the duration of the exploration? The local police in Khovd Province notified the National Museum of Mongolia that they seized some artifacts from a group of looters. Soon afterwards, a professional team was sent to examine the items and explore the cave where the goods were first discovered in. In May, we explored the site for around 10 days and found very well-preserved mummified remains of a horse and rider buried together. You mentioned that locals had looted the cave. Can you describe what the cave looked like when your team arrived? The first thing we did was examine the items the local police had confiscated, which consisted of a vase, bowls, a bow, arrows, wooden saddle equipment, and tools made of wood, leather, and horn. With further examination, we could tell that the artifacts were from a cave burial from its perfect condition. Organic materials can't be preserved so well underground so it could only be from a cave. The police notified the local administrative office and we headed to the cave, located on the southwestern cliffside of a tall mountain named Urt Ulaan Uneet in Myangat soum of Khovd Province. When we arrived, some areas had been looted and destroyed. We found an ancient horse mummy, specifically its head, neck, four hooves and tail wrapped in leather at the mouth of the cave. It was undeniably a historic artifact. What else did you discover in the cave? It was difficult to identify some artifacts because the cave had been ransacked and looted. We discovered torn pieces of a deel. Upon entering the cave, we found a half-dried human mummy, wooden coffin, a deel made of leather, and two leather bags with items inside it. One of the bags contained a round wooden toy inside. The other one seemed to have had powder and liquid inside it because the content had stuck together and dried up. We still haven't examined it yet but we will be able to identify the contents with a laboratory research. We moved the artifacts from the cave and took samples from the cave. We transferred the seized goods from the local police to Ulaanbaatar in accordance with relevant regulations and laws. Your team found the ancient horse and rider mummies in May but the Mongolian public became aware of it only recently. Why didn't you announce your discovery at the time? Immediately announcing archaeological findings has become a trigger that leads to bad things. There are many ancient items in Mongolia. More and more people are starting to think that they could make some money by trading these items. Exaggerated news is making people avaricious and giving them wrong ideas. Most people don't understand that even the smallest crack on a tiny vase or a rip on a clothing could be significant for a research or a study – it's not all about money. This sort of misconception is making people see cultural heritages with greedy eyes. Therefore, we didn't want to make our discovery a huge deal back then. How would you assess Mongolia's protection of cultural heritages? I would say it's extremely poor. Cultural heritages are practically discarded. Right now, cultural properties in remote and desolated places have all been looted. I'm appalled and disheartened by this. People are desolating cultural properties, and the cultural sector is becoming unsupervised. As a researcher, I believe it's time for the state to pay attention to this. The new draft bill on cultural heritages, which is currently under discussion, ensures that people who loot or destroy cultural properties and heritages are held accountable. I assume that the situation will improve when the bill is adopted and implemented. At the moment, Mongolia doesn't have a system which holds people accountable for looting or destroying cultural property. Where is the ancient horse mummy now? Is it being examined? We're doing restoration work on fragile artifacts such as deel, clothing and mummies before moving onto research and examination work. Other artifacts have undergone vacuum treatment and are being stored in the National Museum of Mongolia's inventory. The coffin and saddle are being restored at the Center of Cultural Heritage. What have you found through scientific study? Have you determined the precise dating of the burial? We plan to conduct that study overseas soon. So far, we believe that the burial and artifacts may have originated around 400 years ago. Based on the style of the wooden coffin, saddle and bridle, they may date to the time of the Turkic Khaganate (552 – 756) or later centuries. The findings are very valuable considering the way it has been preserved and the historic information they could provide. The bow still had its string attached and the saddle girth was still intact. We rarely find artifacts in such good condition. Were similar artifacts found in Mongolia before? Archaeologists believe that the culture of cave burial flourished between 6th and 10th centuries. Cave burials are considered scientifically valuable because they were preserved over the centuries in a dry cave and protected by permafrost attributed to Mongolia's cold, arid continental climate. Cave burials yield a wealth of scientific data, which can't be acquired from underground burials. In fact, artifacts found from caves or those protected by permafrost are considered the most significant archaeological findings throughout the world. Permafrost prevents human interference from damaging goods and preserves human mummies in perfect condition for thousands of years. You can still see tattoos of some world-renowned mummies. Mostly artifacts from cave burials are found in Mongolia. Previously, items dating back to the Middle Ages, including horse saddle, a bow and arrows, were found from Artsat Del cave in Bumbugur soum of Bayankhongor Province. They are now being stored at our museum. What's special about the recently discovered horse mummy? The horse mummy has been identified to date back to a very ancient time. It's very significant for getting information on ancient cultures of Mongolians who lived near Myangad soum of Khovd Province around that time. As it is an ancient horse mummy, it's attracting a lot of attention. This finding tells an important story about how Mongolians revered horses and preserved their remains, namely head, four hooves and spine, which were usually wrapped in hide or leather, back in the Middle Ages and Khunnu Era. The remarkable preservation of the horse mummy made it possible for us to sample hair, bone, and soft tissue for genetic sequencing. Also, the deel made from pig skin is an unprecedented discovery. The pattern is slightly different from what was used by Mongolians during the Middle Ages. We have some torn pieces of deel so we will join the pieces together, restore it and then share the results of the analysis. Samples of fur on the deel have been sent to a laboratory for analysis. Ulaanbaatar, October 25 (MONTSAME) The Ambassador Extraordinary and Plenipotentiary to the United Kingdom, Mr N.Tulga handed the Friendship Medal over to the founder of the Wild Camel Protection Foundation (WCPF), Mr John Hare in ceremonial manner, on October 21. Present were, the staff of Mongolian diplomatic mission and John Hare's family and close friends. The Friendship Medal was awarded to him in recognition of his commitment and hardwork for conserving the rare wildlife of Mongolia, especially the Gobi desert. October 25 (gogo.mn) Mongolia is the only home for the Gobi bear, also known as Mazaalai which was defined as critically endangered – regional and international D classification of endangered animals by the International Union for Conservation of Nature Red List of Threatened Species in 2007. It indicates that the Mazaalai not only needs to be protected nationwide, but also internationally. Gobi bears are small compared to most other members of the brown bear family. Female adults weigh only 51‐78 kg and males only 96‐138 kg. Their fur is light brown in color, but with a noticeably darker head, belly and legs. Patches or natural collars of lighter fur are often present on the neck or shoulder of individuals is also a distinguishing characteristic. According to the study conducted in 2010, it is estimated that a minimum of 22‐31 Gobi bears remain in the wild, including at least 8 females and 14 males, based on genetic fingerprinting of hair collected near feeding sites at springs within the area. However, the population fluctuates each year due to the harsh climate and shortage of food and water. They mainly eat roots, berries, and other plants, sometimes rodents and they migrate to other places to look for food. This eventually leads to their drifting apart from each other and stalling their reproduction. Moreover, rangers of the Great Gobi Strictly Protected Area reported that the area experienced a 14‐year drought from 1993‐2007, in which annual precipitation declined from approximately 100 mm to 50 mm. Because Gobi bears are heavily dependent upon vegetation that requires precipitation for growth and fruiting, the drought may have affected body condition and reproductive success of bears during this period. This year, three Gobi bear babies are registered born in Mongolia. Past summer the automatic cameras installed in the Great Gobi Strictly Protected Area caught two female bears with one with her baby twins. Thus the population of the world's rarest bear locally known the Mazaalai is observed increasing. Even, the government has taken a large number of measures to save the Mazaalai, it is still out of public and private attention. · Snow Leopards are being targeted by 'retaliatory' poachers in the high mountain ranges of Asia, a new report says. · Over 90 percent of the reported poaching occurred in China, Mongolia, Pakistan, India and Tajikistan. October 24 (The Weather Channel) Hundreds of endangered snow leopards are being targeted by poachers every year across the mountain ranges of Asia, a new report says. According to a Traffic report, 221-450 snow leopards were estimated to have been poached annually since 2008, and those numbers could be substantially higher. Over 90 percent of the reported poaching occurred in just five countries: China, Mongolia, Pakistan, India and Tajikistan. Of those poached, 55 percent are killed locally in retaliation for livestock losses, 21 percent poached specifically for trade and 18 percent taken by "non-targeted methods such as snares," according to the report. On average, experts estimate that 60 percent — or between 108-219 snow leopards — of retaliatory and non-targeted poaching incidents result in attempts to sell the leopards in the illegal trade market. Mongolia represents the northernmost area affected by the India–Asia collision, and it is actively deformed along transpressive belts closely associated with large-scale strike-slip faults. The active and past mantle flow beneath this region is, however, poorly known. In order to investigate deep mantle deformation beneath central Mongolia and its relation with the surrounding major structures such as the Siberian craton, the Gobi–Altay belt and the Baikal rift, a NS-trending profile of broadband seismic stations has been deployed in the summer 2003 from the southern Siberian craton to the Gobi–Altay range, crossing the entire Hangay dome. Mantle flow is deduced from the splitting of teleseismic shear waves such as SKS phases. In eastern Mongolia, the permanent station ULN in Ulaanbaatar reveals the presence of two anisotropic layers, the upper one being oriented NE–SW, close to the trend of lithospheric structures and the lower one NW–SE, close to the trend of Eurasia absolute plate motion. Along the NS profile in central Mongolia, seismic anisotropy deduced from SKS splitting reveals a homogeneous NW–SE trending structure, fully consistent with the observations made in the Altay–Sayan in western Mongolia. The observed delay times of 1.5 to more than 2.0 s favor consistent mantle flow over large mantle thicknesses. Since the lithosphere is less than 100 km thick beneath central Mongolia and since the observed fast directions are parallel to the trend of the lithospheric structures but also close to the trend of the absolute plate motion, we propose that both the lithosphere and the asthenosphere may join their anisotropic effects beneath central Mongolia to explain the large delay times. Although GPS vectors represent the instantaneous displacement of the Earth's surface and SKS splitting the time and vertical integration of finite strain at depth, we use the opportunity of the dense geodetic measurements available in this region to discuss the anisotropy pattern in term of presentday deformation. In the Eurasia-fixed reference frame, GPS and SKS both depict a similar trend beneath central Mongolia, suggesting a lithospheric block "escaping" toward the east that could orient olivine a-axes in the upper mantle, within a transpressive tectonic regime. A different behaviour is observed in western Mongolia: the GPS vectors trend NS, close to the regional compression direction, whereas the fast SKS directions trend EW, suggesting a tectonic regime close to a mode of axial shortening, generating the development of an EW-trending foliation at depth. We therefore propose that Mongolia is a place where active and frozen lithospheric deformation may add their effects, together with the sublithospheric flow. In the three sources of anisotropy inferred, a fundamental role is played by the Siberian craton that acted as an undeformable core of the continent through time: the frozen Paleozoic and Mesozoic structures wrap around the craton, building up the fast anisotropic direction pattern; the present-day sublithospheric flow induced by the plate motion is likely deflecting around its deep roots; finally, the present-day tectonic regime appears to be controlled by the presence of the craton to the north. October 25 (news.mn) Mongolian top-ranking judoka of her weight (48kg) M.Urantsetseg will compete at the IJF's Grand Slam. The competition will take place in Abu Dhabi on 28th of October. The event will bring together 184 athletes (111 men and 73 women) from 33 countries. Mongolian referee M.Bukhbat will be on the Grand Slam judgement panel. M.Urantsetseg's strongest rivals are expected to be the Olympic bronze medalist G.Otgontsetseg, who is a Mongolian national representing Kazakhstan at international tournaments. Ulaanbaatar, October 25 (MONTSAME) As we informed before, Mongolian athletes E.Sodnompiljee and B.Uugankhuu won bronze medals in 15th Paralympic Games in Rio de Janeiro, Brazil. E.Sodnompiljee's fan G.Dambadarjaa initiated a public campaign to raise funds to present an apartment to E.Sodmonpiljee in honor of his brilliant success in sports. So the administration of Orkhon aimag presented Sodnompiljee a one-bedroom apartment. The governor of Orkhon aimag D.Batlut and the leaders of the Khangarid sports committee received on October 24 the sportsman to wish great successes in his sport's carrier. He can move to his new apartment next year. During the meeting he was awarded a medal of Honored Citizen and MNT one million. One more good news was sounded by the "Ensada holding" company which decided to present a two-bedroom apartment to Sodnompiljee. October 25 (news.mn) 'Troubled Sun' is a new historic play, based on life of Mongolia's most famous writer and poet D.Natsagdorj and will premiere at the National Academic Drama Theatre in November. B.Shinebayar, the "2015 Actor of the Year", is playing the central role of Dashdorjiin Natsagdorj; the part of the poet's wife, Pagmadulam, is being played by N.Bayarmaa. D.Natsagdorj (1906-37), whose statue symbolically replaced that of V.I.Lenin outside the 'Ulaanbaatar' hotel is best known for his poem 'My Homeland' ('minii nutag'), was one of the founders of modern Mongolian literature. He is also well known for his play, the 'Three Sad Hills', recently performed at Naadam. The new historical play will open on 4th of November, marking the 110th anniversary of the great writer's birth and the 85th anniversary of National Academic Drama Theatre. 'Troubled Sun' was written by the famous playwright Sh.Gurbazar and is being produced by Ch.Tuvshin. Ulaanbaatar, October 25 (Montsame) Opera singer B.Batjargal from the Mongolian State Academic Theatre of Opera and Ballet won the third Prize of the Muslim Magomaev International Vocalists Competition in Moscow. Over 150 singers from 18 countries participated in this competition. Before, baritone G.Ariunbaatar was awarded the First Prize of the competition in 2014. October 25 (AP) There is an ancient tradition of falconry practiced by the people of Mongolia where burkitshi, or "eagle hunters," train golden eagles to respond to their call and hunt hares and foxes in the frozen landscape. It's a skill and ceremonial practice that's learned from age 13 and has been largely the domain of men. Enter Aisholpan, a 13-year-old nomadic Kazakh girl who wants to be an eagle hunter. Her father is one. Her grandfather was too. And it's a family tradition that dates back 12 generations. It's this shy, rosy cheeked and brave little girl whose story to become the first female eagle hunter in her family is lovingly told in the documentary "The Eagle Huntress," which is sure to inspire and enchant generations of young children with its heartwarming story and stunning locations. It's fitting that the film is narrated (and executive produced) by Daisy Ridley, who shepherded the "Star Wars" universe into a more empowering space for women with her portrayal of the ambitious and self-sufficient Jedi-in-training Rey. Director Otto Bell embeds the audience in Aisholpan's world, which looks both modern and ancient at the same time. She lives with her parents and siblings in a spacious yurt. Her mother cooks and cleans and her father herds goats and cattle across the Mongolian Steppe. Aisholpan helps out with the chores at home and is a top student who hopes one day to become a doctor. But first, she wants to follow in her father's footsteps and train eagles. There is an obvious girl power message in the film that's spelled out loud and clear by both the narration and the framing of Aisholpan's accomplishments. Although her father and mother support her dreams, Bell makes sure to show a room of elder eagle hunters expressing doubts about a woman's ability to perform the job because they lack the necessary bravery and are "too fragile." They might as well be twirling their mustaches for how on the nose it all is. In fact, there's an overriding level of artifice to "The Eagle Huntress" that's hard to shake. Bell opts for reality show techniques to up the drama throughout, like a cut of Aisholpan removing her hat at a competition to reveal she's a girl juxtaposed with a shot of a man looking aghast while the music crescendos. Was he really looking at her? Was it an authentic moment? As it plays out, it certainly doesn't feel real even if the spirit of truth is there. It's something that's unlikely to bother or even register with younger audiences and perhaps it's even a necessary storytelling device. But it does break the spell of this otherwise enchanting and quite sincere film. It's hard not to get swept up in Aisholpan's bravery and determination as she climbs down a rocky terrain to kidnap her very own eagle, or as she braces for impact when her eagle swoops down to land on her arm. The drone shots of the landscapes, too, are something to behold. It is indeed a rare and special story, and, as a film, it's a wholesome lark that you'll want to show your daughters and sons. "The Eagle Huntress," a Sony Pictures Classic release, is rated G by the Motion Picture Association of America. Running time: 87 minutes. Three stars out of four. Ulaanbaatar, October 25 (MONTSAME) On October 24, Speaker of Mongolian Parliament M.Enkhbold received the director of Korean Airlines Co Ltd., Chi Chang Hun. Mongolia attaches a great importance to the relations with South Korea, with whom Mongolia has the broadest interactions in commerce, investment and public diplomacy within the region, underlined the Speaker. He highlighted that the comprehensive partnership with our "third neighbor" has been reaching out all spheres, as well as remarkable progress is seen in the high-level visits and people-to-people contacts. Mr Chi accented that this year is marking the 25th anniversary of the debut KAL flight to Mongolia. Mentioning the Mongolian side and South Korea's Hanjin Group has been maintaining close partnership for many years, he applauded the sides are succeeding in forwarding cooperation through KAL-MIAT joint flights and organizing training for the Mongolian engineers and aerodrome workers. While highlighting an important role of airports' operation in the development of aviation, Mr Chi congratulated on a New Ulaanbaatar International Airport to be commissioned shortly. "I am in favor of a plan the Minister of Road and Transport Development of Mongolia informed of during our meeting, about re-constructing the old airport into a training center for pilots and airline workers", said the director of KAL. At the end of the meeting, Speaker M.Enkhbold wished to forward the long-standing traditional collaboration in more effective way, and pledged all means of support on the part of the Mongolian Parliament in promoting and protecting foreign investments.